The easiest way to stay compliant. 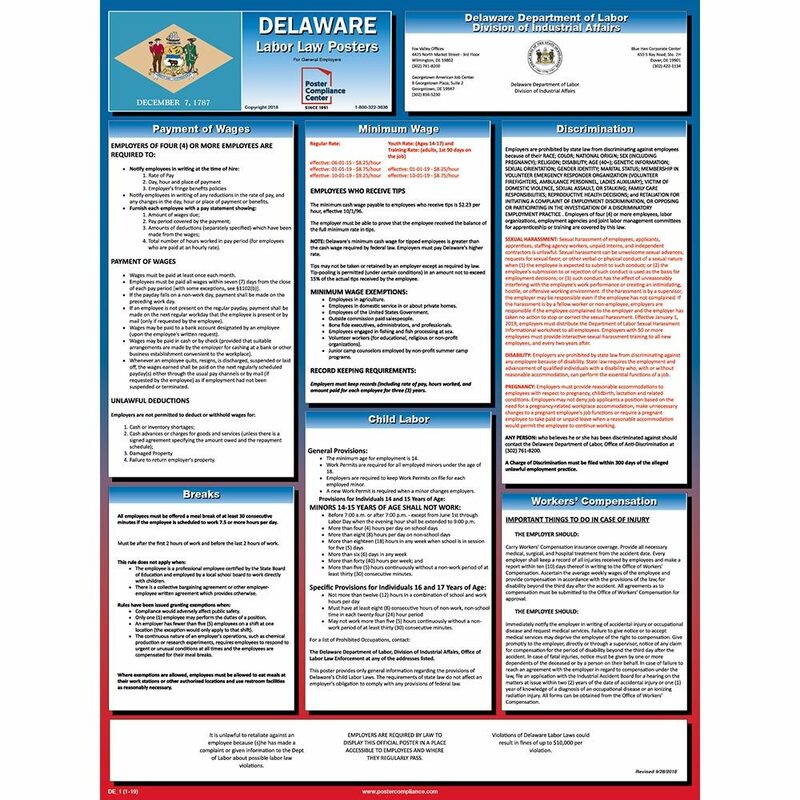 The OneSystem Plan offers required Federal and Delaware State posters plus 12 months of mandatory updates for free! The minimum wage rate increases to $8.75 per hour. The new youth & training minimum wage rate is $8.25 per hour for workers ages 14–17 and for adult trainees during their first 90 days of employment. All employees must now be offered (rather than receive) meal breaks of at least 30 consecutive minutes when working 7.5 or more hours per day. In addition to employees, sexual harassment against applicants, apprentices, staffing agency workers, unpaid interns, and independent contractors is unlawful. Employers must distribute the Department of Labor Sexual Harassment Informational Worksheet to all employees. Employers with 50 or more employees must provide interactive sexual harassment training to all new employees, and every two years thereafter. Minimum wage increases to $8.75 per hour. New youth & training minimum wage is $8.25 per hour (workers ages 14–17 and adult trainees during first 90 days of employment). All employees must be offered meal breaks of at least 30 consecutive minutes when working 7.5+ hours per day. Sexual harassment against employees, applicants, apprentices, staffing agency workers, unpaid interns, and independent contractors is unlawful. Employers with 50+ employees must provide interactive sexual harassment training to all new employees, and every two years thereafter.